If you ever need a book to read aloud – to a group of children, to a grandchild, to yourself on a crummy day – B.J.Novak’s The Book With No Pictures is the one. The book uses words to create effect with no illustrations – not one. Some of the crazy words remind me of Lily Tomlin’s wild chanting in “Grace and Frankie” – not the kind of sounds usually coming out of a book – but fun to enunciate. Read it out loud and laugh at yourself. His baby son’s mispronunciation of “bicycle” was the inspiration for the title of Dan Santat’s 2015 Caldecott winning picture book – The Adventures of Beekle. 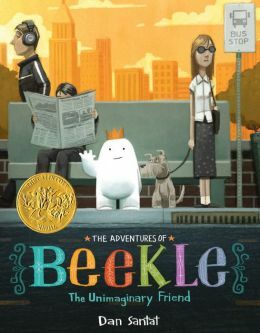 Beekle is an imaginary friend who has yet to be imagined by a real child. Rather than wait on his island for his special someone to appear, Beekle sets off to find her. Santat floats him through a series of adventurous illustrations, with Beekle travelling through dark starry nights, reminiscent of Chris van Allsburg’s designs, to encounters with colorful dragons and double-page drawings of whales and harbors that mirror Maurice Sendak’s wild ones, until he finally reaches the real world. Searching for his friend takes him through busy streets and subways, to fantastic playgrounds, and finally to the top of an amazing tree. When Beekle does find his friend, Alice, the relationship slowly blossoms from shyness to perfection, and the story ends with a frame of Alice and Beekle connecting with a real boy and his imaginary friend, happily proclaiming – “The world began to feel a little less strange.” Friends can give you the courage to face the world – both the real and the imagined. A lovely book to share and read aloud, as the pictures evolve in color and excitement to the final happy ending. 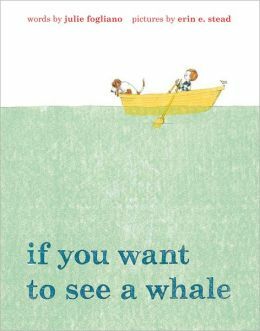 A lesson in patience – and maybe meditation – Julie Fogliano’s children’s picture book If You Want To See A Whale has a calming quality and a reminder to stop and observe your surroundings – a message for adults as well as children. With simple colorful illustrations, the story follows a little boy and his dog as they sit and stare at the ocean, waiting for a whale to appear. With distractions everywhere, focusing on the task is not easy, but they succeed in the end. 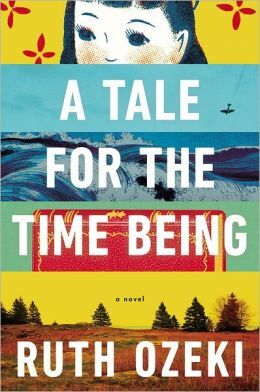 I am currently reading Ruth Ozeki’s A Tale for the Time Being – another exercise in focus and patience. Ozeki is a “writer, filmmaker, and Zen Buddhist priest,” so I can’t help wondering if she injected lessons in patience and meditation into this slow read. But I am staying on task, and hope to succeed. Budapest is a city on my bucket list, and the illustrations of that city by LeUyen Pham in Deborah Heiligman’s The Boy Who Loved Math offered a glimpse of its charm. 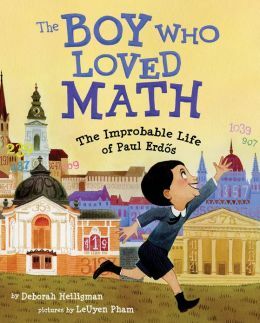 This picture book is a biography of Paul Erdős, the mathematical genius who grew up in Budapest as a child prodigy who loved to play with numbers but had trouble following rules and completing mundane tasks – like buttering bread. Erdős did not like school and his eccentricities may have been hard to live with – unless you were his mother – but Heiligman cleverly focuses on his strengths and offers an inspiring and engaging story for children as well as adults. As she humorously documents this genius’ idiosyncracies, Heiligman gives him credit for his contributions and many collaborations, spawning the Erdős number (which calculates the degrees of collaborative separation between mathematicians and Erdős – Einstein was number 2 – before anyone thought of six degrees of separation. 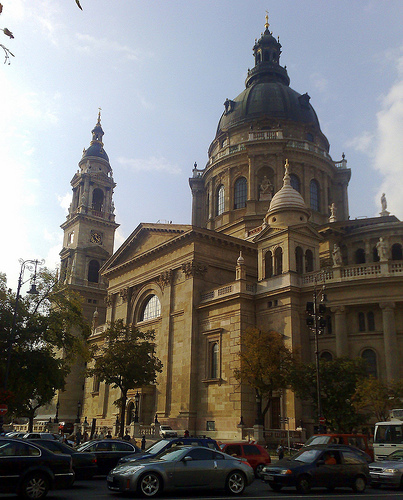 I have The Boy Who Loved Math on my list now for gift-giving and as a reminder to visit Budapest someday.